In 2017, my colleague Colin Robertson and I began a 3-year project that combines GIS modelling and on-the-ground field research to identify the possible links between droughts and other environmental hazards and rural population change on the Great Plains since the 1960s. When we think of droughts in that region, we tend to think of the 'Dirty Thirties'/Dust Bowl era and the large scale migration that ensued. However, recent studies have shown that droughts can be associated with population decrease in rural North America; the association is simply more subtle than it was back in the Thirties. With help from colleagues at the University of Colorado, we hope to identify more clearly the present-day relationship between drought and rural population numbers on the Plains, and the implications for that region in the face of a warming climate. Funding: Social Science and Humanities Research Council of Canada, Insight Grant. Colleagues at the University of Ottawa and I conducted interviews and focus groups with selected immigrant communities in Ottawa, Montreal, and Toronto to find out if and how environmental conditions in their home countries affect people's decisions about migrating to Canada. Results have started to come out; please click here to visit the project website for more details and a list of publications. you can also read about our project findings in this commentary for the Montreal Gazette. Funding: Social Science and Humanities Research Council of Canada, Standard Research Grant. On January 8, 2013, Colin Robertson and Haydn Lawrence of WLU and I launched RinkWatch, a citizen science project that encourages people who maintain an outdoor skating rink in their yard or neighbourhood park to pin the location on an online map and then record skating conditions over the course of the winter. The project quickly caught media attention in Canada and the US, and in the space of eight weeks almost 1,000 rinks were registered. The chief scientific aim is to use this crowdsourced data to track winter weather trends, in much the way scientists use birdwatchers' sightings to track bird population patterns. The larger aim is to connect families with environmental science in a way that is fun and to which they can easily relate. Click here to watch a story about RinkWatch on CBC TV's The National with Peter Mansbridge. The RinkWatch project made the pages of National Geographic's March 2014 issue.This project is presently unfunded, but has received considerable technical support from ESRI Canada and Canadian Tire. Click here to read our "RinkWatch Manifesto" in the Globe and Mail. And don't forget to follow RinkWatch on Facebook and Twitter. Our first peer-reviewed scholarly journal article reporting findings from the project appeared in The Canadian Geographer late 2015. The citizen science website NatureWatch.ca was founded back in the 1990s by federal government agencies and the Canadian Foundation for Nature as a means of encouraging Canadians to engage in environmental citizen science. Although it was once ahead of its time, a lack of investment in recent years left the site slow, dated, and with a rapidly declining usership. In 2011, colleagues at the University of Ottawa's Department of Geography and I took over responsibility of the website from the government, and with partners at Nature Canada, David Suzuki Foundation, and UO's Centre for e-learning we gave the website a complete overhaul, adding new interactive and mobile-friendly features, and relaunched it. We also built a new program to monitor milkweed across Canada, as part of wider efforts to protect endangered monarch butterflies. NatureWatch is returning to Environment and Climate Change Canada's care in April 2019. Please check it out. Funding: Social Science and Humanities Research Council of Canada, Partnership Development Grant. I was lead investigator of a multi-university, multi-year project in the Addington Highlands/North Frontenac region of eastern Ontario, where residents’ livelihoods depend on a mix of outdoor recreation and tourism, forestry and other land-based activities. The project used a combination of human and physical geography and GIS methods to find ways of enhancing community capacity to adapt to climatic stressors, pressure on critical resources and socio-economic change. Eight graduate students were trained as part of this project, and several undergraduate field research courses took part over the years. A list of publications related to this project appears below. Funding agency: Social Science and Humanities Research Council of Canada. Keizer, P., Gajewski, K., & McLeman, R. (2015). Forest dynamics in relation to multi-decadal late-Holocene climatic variability, eastern Ontario, Canada. Review of Palaeobotany and Palynology, 219, 106–115. Sioui, M., & McLeman, R. (2014). Asserting mino pimàdiziwin on unceded Algonquin territory: Experiences of a Canadian “non- status” First Nation. AlterNative, 10(4), 354–375. Kennedy, R., McLeman, R., Sawada, M. Smigielski, J. (2014). Use of Smartphone Technology for Small-Scale Silviculture: A Test of Low-Cost Technology in Eastern Ontario. Small Scale Forestry, 13(1), 101–115. McLeman, R., Ford, J. D. (2013). How Demographic Change and Migration Influence Community-Level Adaptation to Climate Change: Examples from Rural Eastern Ontario and Nunavut, Canada. In T. Faist & J. Schade (Eds. 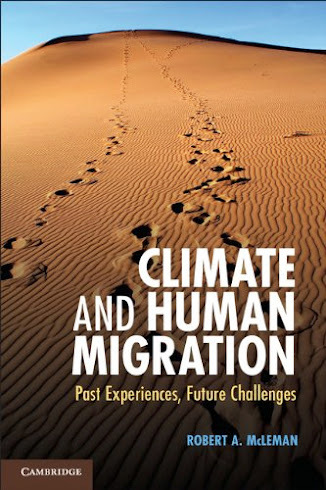 ), Disentangling Migration and Climate Change: Methodologies, Political Discourses, and Human Rights (pp. 55–79). Berlin: Springer. Clark, K., McLeman, R. (2012). Maple Sugar Bush Management and Forest Biodiversity Conservation in Eastern Ontario, Canada. Small Scale Forestry, 11(2), 263–284. McLeman, R. (2010). Impacts of population change on vulnerability and the capacity to adapt to climate change and variability: a typology based on lessons from a hard country. Population and Environment, 31(5), 286–316. I regularly collaborate with researchers in Canada and abroad, and through organizations such as the International Institute for Sustainable Development, on a variety of research projects that investigate interactions between environmental change, human wellbeing, migration and state security. Examples include studies of environmental refugees, climate change-related threats to Canadian security, linkages between sustainable development and refugee protection, and climate change and migration in West Africa. McLeman, R. (2013). Labor Migration and Food Security in a Changing Climate. In C. Barrett (Ed. ), Food Security and Sociopolitical Stability (pp. 229–255). New York: Oxford University Press. McLeman, R. (2011). Climate change, migration, and critical international security considerations. Geneva: International Organization for Migration. [free download]. Brown, O., McLeman, R. (2009). A Recurring Anarchy? : The emergence of climate change as a threat to international peace and security. Conflict, Security and Development, 9(3), 289–305. Brown, O., Hammill, A., McLeman, R. (2007). Climate change as the “new” security threat: implications for Africa. International Affairs, 83(6), 1141–1154. This project provided graduate students opportunities to investigate the impacts of climate on demographic patterns on the Canadian Prairies using GIS models and qualitative field research. The GIS work combines historical climate model data, soil maps and population census data to identify ‘hotspots’ where population numbers appear to be strongly influenced by drought and other climatic extremes. Student researchers then traveled to selected hotspots to study the specific nature of human-environment interactions in those locales and to understand how and why migration patterns respond to climatic conditions. Laforge, J., McLeman, R. (2013). Social capital and drought-migrant integration in 1930s Saskatchewan. The Canadian Geographer, 57(4), 488–505. McLeman, R., Ploeger, S. K. (2012). Soil and its influence on rural drought migration: insights from Depression-era Southwestern Saskatchewan, Canada. Population and Environment, 33(4), 304–332. Gilbert, G., McLeman, R. (2010). Household access to capital and its effects on drought adaptation and migration: a case study of rural Alberta in the 1930s. Population and Environment, 32(1), 3–26. McLeman, R., Herold, S., Reljic, Z., Sawada, M., McKenney, D. (2010). GIS-based modeling of drought and historical population change on the Canadian Prairies. Journal of Historical Geography, 36, 43–55. This SSHRC Knowledge Synthesis Grant project undertook a detailed synthesis of barriers & opportunities for improving ICT access in Canadian rural & remote communities as part of a broader strategy for building adaptive capacity and sustainable development in the face of global economic and environmental change. Please contact me for a copy of the Knowledge Synthesis report. Click here to read my Globe and Mail Commentary about the importance of rural broadband and wireless. This collaborative project involved research teams from several Canadian universities and community stakeholders from three rural Canadian municipalities. My team, which included 2 graduate students, worked with members of the community of Edwardsburgh-Cardinal, Ontario to identify opportunities and barriers for enhancing the future capacity of residents to adapt to a range of stresses related to climate, land use change, changing currency exchange rates and rising energy costs. Copies of the final report from this project can be obtained by sending me an e-mail. McLeman, R., Brklacich, M., Woodrow, M., Gallaugher, P., Vodden, K., Sander-Regier, R. (2011). Opportunities and Barriers for Adaptation in Canadian Rural and Resource-based Communities. In J. Ford & L. B. Ford (Eds. ), Climate Change Adaptation in Developed Nations (pp. 449–460). Dordrecht: Springer. Sander-Regier, R., McLeman, R., Brklacich, M., Woodrow, M. (2010). Planning for climate change in Canadian rural and resource-based communities. Environments, 37(1), 35–57. This multi-year project investigated the ways by which rural household and communities adapted to conditions of extreme drought and economic collapse in the southern Great Plains during the 1930s. In what was one of North America’s worst environmental disasters, hundreds of thousands of people adapted by migrating out of drought-stricken areas, many moving to California in what has been popularly described as the “Dust Bowl migration”. I have used this case to explore new theories of human migration behaviour based on household access to capital and test typologies of agricultural adaptation to climate change. I hope to return to the southern Plains in coming years to study how urban centres are coping with drought-related shortages in water supplies. McLeman, R. (2009). Climate change and adaptive human migration: lessons from rural North America. In N. W. Adger, I. Lorenzoni, K. O’Brien (Eds. ), Adapting to Climate Change (pp. 296–310). Cambridge: Cambridge University Press. McLeman, R. (2007). Household Access to Capital and Its Influence on Climate-Related Rural Population Change: Lessons from the Dust Bowl Years. In E. Wall, B. Smit, J. Wandel (Eds. ), Farming in a Changing Climate (pp. 200–216). Vancouver: UBC Press. McLeman, R., Mayo, D., Strebeck, E., & Smit, B. (2008). Drought Adaptation in Rural Eastern Oklahoma in the 1930s: Lessons for Climate Change Adaptation Research. Mitigation and Adaptation Strategies for Global Change, 13(4), 379–400. McLeman, R., Smit, B. (2006). Migration as an Adaptation to Climate Change. Climatic Change, 76(1-2), 31–53. Residents of seasonal economy communities engage in a number of land-based livelihood activities that vary according to season. This project investigated the vulnerability of social and economic activities of residents of Addington Highlands, Ontario, to ongoing changes in climatic conditions.